This post on Suspense in Writing by the lovely Katharine Owens, complete with stills from some classic Alfred Hitchcock movies. Kat’s post is compilation of tips from Simon Wood’s original article for Writer’s Digest, which you can find HERE. This bit of fabulous from Alison Miller on Reading for Pleasure. “Look, I’m as busy as the next person, but reading is a priority to me.” Yep, I couldn’t have said it better myself, Alison. Not only is reading fun, inspirational, and relaxing, but for a writer, it’s crucial to professional development. 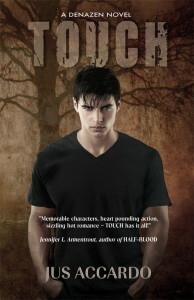 My CP Jus Accardo‘s debut Touch is available in eBook today! You’ll have to wait until November 1st for the paperback version, but if you’ve got an eReader, you can find Touch at Barnes and Noble, Amazon, and Books on Board. And do check back here for more about Touch and an interview from Jus in the very near future! And, finally, we’ve got an October novel for Tracey Neithercott’s Fall Book Club! Around the world, black handprints are appearing on doorways, scorched there by winged strangers who have crept through a slit in the sky. In a dark and dusty shop, a devil’s supply of human teeth grown dangerously low. And in the tangled lanes of Prague, a young art student is about to be caught up in a brutal otherwordly war. Meet Karou. She fills her sketchbooks with monsters that may or may not be real; she’s prone to disappearing on mysterious “errands”; she speaks many languages–not all of them human; and her bright blue hair actually grows out of her head that color. Who is she? That is the question that haunts her, and she’s about to find out. When one of the strangers–beautiful, haunted Akiva–fixes his fire-colored eyes on her in an alley in Marrakesh, the result is blood and starlight, secrets unveiled, and a star-crossed love whose roots drink deep of a violent past. But will Karou live to regret learning the truth about herself? I couldn’t be more excited about this selection! We’ll be discussing the book on Friday, October 28. If you have a blog, post your thoughts on the book there, then leave a link to your blog over at Tracey’s on October 28th. If you don’t have a blog, leave your thoughts in the comments on other members’ blogs, which you can easily get to by clicking the links on Tracey’s post. I hope you’ll participate! So, that’s what I’ve got for you today. Do you have anything writerly, readerly, or otherwise interesting to share? Have a lovely Monday, and I’ll see you in two days for Road Trip Wednesday! Thanks for including me, and I’m loving all these other posts. Enjoy diving into your rewrites! Thanks, lady! Having lots of fun with it so far! I agree! 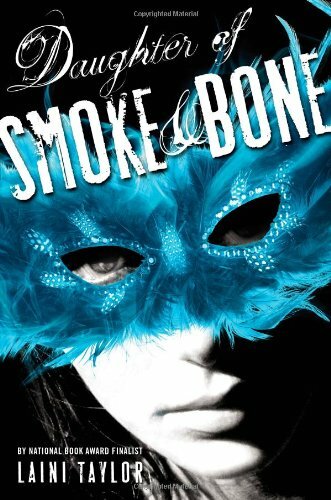 It was so fun to read everyone’s thoughts on MISS PEREGRINE last month, and I’m totally looking forward to diving into SMOKE AND BONE. Congrats on your revising, and thanks for the link roundup! Good luck with the revisions! It’s good to hear you’re excited about them. I am excited! I think they’re really bringing a new layer of tension to the story, which is never a bad thing. 🙂 Can’t wait to finish so I can dive into SMOKE AND BONE. Thanks for hosting another month of Book Club! Now, must check out KT’s post! That was meant to be KO. I’m full of bloopers today! Ha! Happens to the best of us some days. YES! Looking forward to joining in on the conversation! It’s great to hear that your revision is going so well! Thanks for the links. Thanks for the links. With nothing to say, you sure had a lot to write on your post today! That’s awesome. When my brain is mush or preoccupied, my blog post is like two sentences long and really not worth anyone’s time.